A 'hard' Brexit would be bad enough, but the UK government’s failure to appreciate the complexities of the process makes the situation much worse. A commentary by Richard Grieveson. Contrary to the hopes of many people in the UK and across the rest of the EU, recent events have reinforced the impression that the UK is not only on course for a hard Brexit, but also a potentially chaotic one. 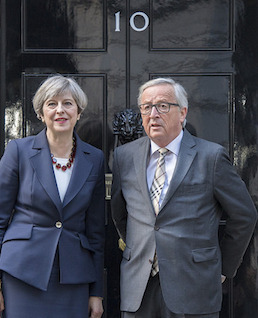 Leaks to the Frankfurter Allgemeine Zeitung (FAZ) from a recent meeting between European Commission president Jean-Claude Juncker and UK Prime Minister Theresa May demonstrated the extreme level of unpreparedness and complacency on the UK side. Yet this is only the most obvious example. Statements from senior figures in the Conservative Party have regularly indicated that they are hopelessly unaware of the reality of the course they are so brazenly steering the UK towards. The UK government’s approach to Brexit negotiations has two basic flaws, both of which put it at a serious disadvantage to the EU27 side in negotiations. First, it relies on means of conducting business not untypical in the UK: talk earnestly and positively, and worry about the details later. The leaked details of the Juncker-May meeting painfully expose this flaw. British ungenauigkeit (inaccuracy or imprecision) is often remarked upon by non-Brits, and is visible in everything from the shoddy quality of the UK’s housing stock to its poor productivity record. It is notably prevalent among a certain model of blustering ex-private school boy who is good at debating games, where there are no real consequences. This jars badly with the prevalent approach in continental Europe, where the knowledge of substance and details are central, and positive pronouncements alone count for much less. The second UK flaw is insularity, and basic indifference among many (particularly, but not only, in the Conservative Party) to how things are done in other countries. Even UK politicians and journalists with an interest in the rest of the world tend to be more familiar with the US than continental Europe. Many UK politicians seem unaware that other countries have interests that are equally valid and which do not necessarily overlap with those of the UK, and that the EU is seen very differently by the political elite in other states, especially Germany. This ignorance has led to some dangerous miscalculations on the UK side. Some Conservative politicians have maintained the illusion that the German business community will somehow ensure a good deal for the UK in order to protect its profits. What the UK public expects from Brexit remains unclear. Opinion polls on this topic are contradictory. Yet this insularity was clearly a factor. The idea that Brexit was about imperial nostalgia, while not totally redundant, is much less convincing than the view that it was a vote to be left along by the rest of the world. Ms May’s decision to prioritise the ending of free movement and the jurisdiction of the European Court of Justice (ECJ) in the UK are a defensible reading of public opinion. YouGov, a polling agency, concludes that Ms May is going for a type of Brexit that roughly intersects with the point of maximum public support. Even in Scotland, the Conservative Party is enjoying a strong resurgence. One recent poll found that Ms May is more popular in Scotland than Nicola Sturgeon. Last week the Conservatives registered the best result for a governing party in local elections in the UK for 40 years. That Ms May took this course is not simply about courting popularity, however. She also appears to be personally inclined towards the type of Brexit she has chosen. Even though Ms May was a (quiet and reluctant) 'remainer', this less outward-looking Britain is one she understands well. She represents the provincial and culturally conservative UK of David Goodhart’s 'Somewheres'. This part of the UK does not like the social and cultural change that the mass immigration of recent decades has contributed to. It is also the heartland of British exceptionalism, which can never accept a foreign court having jurisdiction in the UK. While there is undoubtedly serious backing for Ms May’s chosen form of Brexit, the fact that 48% voted to remain appears to have been largely forgotten. The fact that the government can get away with ignoring the views of almost half of the electorate over Brexit owes much to the fecklessness of the main opposition Labour Party and its leader, Jeremy Corbyn. Mr Corbyn is an old school hard left activist who appears even to many Labour voters to be unfit for the office of prime minister, and probably does not even want it. He and his front bench cannot provide any meaningful critique of or challenge to the government’s plans. Diane Abbot, the shadow home secretary, and one of Mr Corbyn’s most trusted lieutenants, gave an interview last week in which she appeared unqualified to do basic maths, never mind be a serious frontline politician. As a result, the Conservative government’s Brexit approach is being exposed to an extraordinarily low level of scrutiny in parliament. In theory, this scrutiny and representation of the 48% in parliament could come from elsewhere. At a minimum, a very sizeable minority of the UK electorate would at least consider voting for a candidate in favour of a much softer 'Brexit'. But the Liberal Democrats—who could fill such a role—are hamstrung by their damaging recent period in office, the weakness of their leadership, and the adversarial nature of UK politics, which hugely favours the main two parties. Brexit might yet bring a repeat of the sea change of the early 20th century, when Labour replaced the Liberals as the second main party in UK politics, but that still looks some way off. The lack of serious leadership across UK politics is stark. As the journalist Janan Ganesh recently bemoaned, politics in the UK hardly attracts the best and the brightest. Former Prime Minister Tony Blair remains reviled by a majority of voters due to his decision to invade Iraq in 2003. Yet his recent interventions against Brexit show a politician who in intellect and ability to communicate stands way above almost all of the current crop. Unless Theresa May has a dramatic change of heart, Brexit is likely to be hard and potentially chaotic. The economic impact for the UK will be serious and negative, and anger will rise. The UK population has been given unrealistic expectations about how easy the process will be, and the potential negative consequences have been played down by the government. What happens when reality dawns is a difficult question to answer. Divisions among voters are huge; not just between those in favour of remain and leave, but within the leave camp, between 'out into the world' types and nativists. More broadly, the UK needs to decide what kind of country it wants to be post-Brexit. This will be difficult, but the issues are real, and Brexit is likely either to aggravate them, or postpone solutions for a very long time. The UK is heavily reliant on London; most regions are poorer than the EU average (the exceptions are the South-East of England and the area around Aberdeen). It runs persistent current account deficits which rely on capital inflows and lead to higher debt. Continuing to attract large amounts of foreign capital also requires a fairly liberal set of policies, including on immigration, which appear squarely at odds with the Brexit vote and the government’s reading of it. Productivity is significantly lower than in Germany and France; education and infrastructure are major deficiencies and do not compare well with EU peers. For the rest of the EU, the situation is not as drastic. It has been evident since the Brexit vote that a greater degree of unity would be likely, at least for a while. This is reinforced by other outside factors—notably events in Turkey and the election of Donald Trump as US president—where the degree of consensus among the EU27 is quite high (Russia is more of a mixed case). Recent internal developments, particularly the presidential election result in France, are also positive from this perspective. Yet Schadenfreude from pro-EU voices in the EU27, while understandable, should be tempered. The UK is a big economy, and a crash (or, more likely, a prolonged period of meagre growth) as a result of Brexit will affect the rest of the continent. Migration flows will be disrupted, and EU funds for CEE (which represent several percentage points of GDP) will be lower. Meanwhile, although the eurozone is experiencing a rather impressive cyclical upswing, major structural deficiencies remain, not least in France. In this regard, expectations that Germany will be willing to relax its stance on fiscal austerity in the eurozone are unlikely to be fulfilled. New elections in important countries, including Germany, Austria and Italy, will come round pretty soon and could pose a whole new set of challenges.